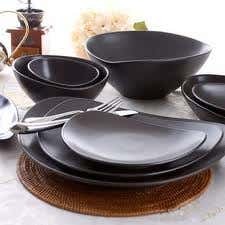 Black tableware is something that you can use as your choice in tableware. This is a choice that can affect the look of any space. You will be able to create an ambience that might be a little different from other looks you have seen in the past. It seems as though many people choose basic white or clear tableware for their homes. Black can make your next get together a very fun one. Black is a color that is often very elegant and this can be a perfect color for many occasions. Something that many people have not heard about is bamboo disposables. Bamboo is very durable and when you are done with this type of plate or tableware you can easily throw it away. This might be something that is worth exploring and if you have a wedding or other special event coming up there might be many bamboo options that can help you to really pull off a great look. Bamboo is something that will likely be very exciting for your guests also if this is something that they have never seen before. Plastic flutes champagne glasses are another great option for your next party. This is a great choice and you can get as many flutes as you will need. With plastic you do not have to worry about broken glass if something is spilled. Plastic is easily disposed of and your guests will not have to leave their glasses lying around when they are done. They can be thrown away and this is a very easy clean up for a party. There are some great elements of a party that you can use to help you ensure that your next gathering is something that you are truly proud of. You can use elements that are unique and help you to create the gathering you had in mind.